This is the first school year officially homeschooling our daughter, she is 4-years- old in TK, and enrolled with Inspire Charter School in California (Click here to see my list comparing Charter Schools in Southern California). This list is for homeschooling parents of charter school students, that receive funding. Most charter schools will give your student/ child funds to be spent on classes, services, and/ or products, etc. used for education. With products, its broken down into two categories, consumables and non-consumables. Consumables are products or items that the student will use up completely and therefore the item cannot be used by another student. Examples include; Classes, Field trips, memberships, subscriptions, and many products/ items. (Click here to see my list of Consumables). Non-Consumables are products & items that can be used again by another student (the products/ items will go to a lending library after they are returned to the school (you do not have to return them until your youngest/ last child is Un-Enrolled out of the school or graduates. Inspire Lending libraries are where you can go and “rent or check out” educational items like a regular library. You can borrow educational materials so you don’t have to use your funds. (Examples include; books, computers, instruments etc). My husband and I decided at least for now, we only want to spend our daughter’s funding on consumables. Last year, I wrote a post entitled “The Ultimate Consumable Idea List for Charter School Funding“. It had such a great response and since then I have spoken with parents who told me their favorite fund purchases they have used for Non-Consumables. So I decided to create this post for those in need of ideas of Non Consumable educational products that can be purchased with charter school funds. 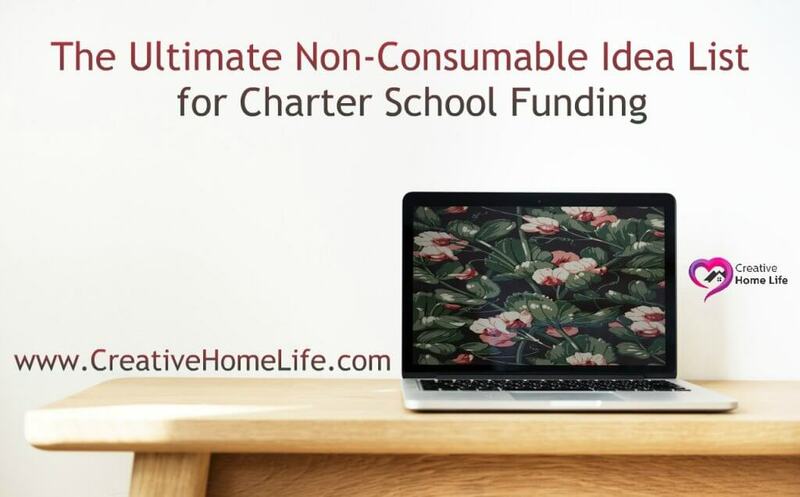 This list of Non-Consumables is comprised of my own ideas, online research, and personally speaking with teachers and other home school parents. One great thing about Inspire is your child’s unused funds are rolled over to the following year if you don’t use them all (one of the only Charter school’s that roll funds over). Every charter has different rules, what one school considers Consumable another may not. If you have any question you can always contact your teacher before placing an order. Keep in mind that some things get marked wrong on accident. If that happens, you can always contact your teacher and ask them about it, it can be fixed in their system. Sometimes the teacher or people ordering aren’t positive what is in the subscription or what exactly the item is and don’t want to mark it wrong, inadvertently it still happens. From my understanding everything is automatically marked a non-consumable by default, they have to change it in the system when it is not. Also, our ES (teacher) said if you do order non-consumables and in her words “they break, just snap a photo or keep in a bag and return it so they see it was well used etc. accidents do happen. They take that into account.” Also, you can order from any website you want to, if it’s not on the list just click the “Other Vendor” option. You can order any online curriculum (if it’s not religious). If you are with Inspire and interested in a certain type of class, utilize the Inspire Enrichment Order & Vendor Lobby online, you may find a local vendor for the class your child is interested in. If you are interested in a local class that is not with Inspire or (another charter), try speaking with them you may be able to convince them to become a vendor for charter schools. We have a huge collection of educational materials that I have purchased before joining Inspire. My favorite places to find treasures (many you can find new & new in box) are thrift stores, estate & yard sales, OfferUp App, Dollar Tree, 99 Cent Only Stores, online (Amazon, eBay, and Facebook Marketplace). Please check back regularly, as I will update this post, as I come across Non-Consumable ideas. If you have any suggestions for Non-Consumables that should be added to this list or a favorite educational online store not shown. Also if you have any questions about this post, or anything else… Please feel free to message me or leave a comment. Thank you for reading!